Hollywood superstar Bruce Willis brings a powerful presence to an edge-of-your-seat thriller from writer-director M. Night Shyamalan hat critics are calling one of the greatest ghost stories ever filmed. When Dr. Malcolm Crowe (Willis), a distinguished child psychologist, meets Cole Sear, a frightened, confused, eight-year-old, Dr. Crowe is completely unprepared to face the truth of what haunts Cole. With a riveting intensity you'll find thoroughly chilling, the discovery of Cole's incredible sixth sense leads them to mysterious places with unforgettable consequences! Download The Sixth Sense in Digital HD from the iTunes store. 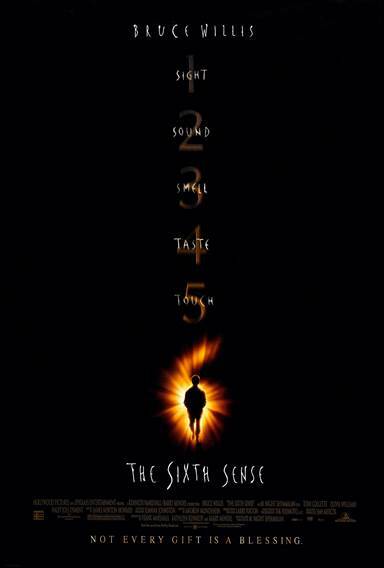 The Sixth Sense images are © Hollywood Pictures. All Rights Reserved.